From the first moment you pick up the Olympus SP-550UZ, you know it’s a quality piece of kit. 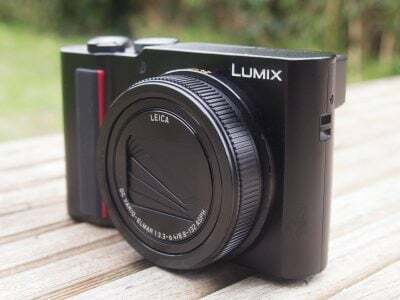 Measuring 116x79x78mm, it’s surprisingly compact given its 18x optical zoom range, and to put it in perspective we’ve pictured it below alongside the Nikon D40 and Panasonic Lumix FZ50 super-zoom; these models have 3x and 12x optical zooms respectively. The SP-550UZ’s build quality and ergonomics are excellent. Virtually the entire front surface sports a tactile rubber coating which extends around the lens barrel and onto the thumb-rest on the rear. 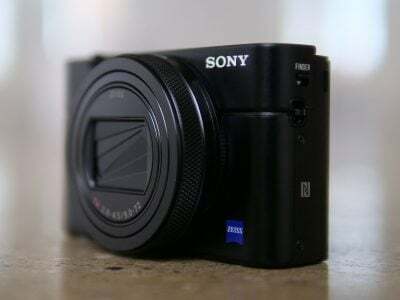 Coupled with a decent-sized grip, you can hold the camera very comfortably and securely. The optional PT-037 underwater housing also allows you to take the SP-550UZ to depths up to 40m. Like most higher-end compacts, the SP-550UZ features an SLR-style command dial on its upper right surface; this offers the usual Auto, Program, Manual, Aperture and Shutter Priority modes, along with Play, a movie mode, ‘My’ setting for custom options, a ‘Guide’ option which helpfully takes you through various photo techniques, and SCN which presents the choice of 23 presets with handy thumbnail examples. The rotary zoom rocker is positioned around the shutter release button with power and image stabilisation controls alongside. The rear surface is kept quite simple with a four-way rocker offering quick access to exposure compensation, flash, self-timer and macro options. Around this are controls to fire-up the menus and overlay various on-screen graphics, along with a button to switch between the screen and EVF, and a duplicate Play button. Pressing the OK / FUNC button in the middle of the four-way rocker overlays a menu on-screen allowing you to quickly change white balance, ISO, drive and metering modes. It’s good to have instant access to these settings without delving into menus and we have a demonstration of it in use in our video tour. The Olympus SP-550UZ offers Spot, Center-weighted and ESP metering modes, the latter taking the entire frame into account. ESP delivers generally well-balanced results in most circumstances and we rarely found any occasions where it was fooled. Many of the SP-550’s images can look slightly over-exposed at first, but this is more down to its default image processing which can easily be adjusted. The SP-550UZ offers shutter speeds from 1/2000 to half a second, which the Night Scene extends to four seconds and the Bulb mode to eight minutes; the latter sounds impressive for a compact, but you’ll need to manually hold the shutter release button down for the duration of the exposure and it’s also only available at sensitivities up to 200 ISO. Exposure compensation is available in the standard +/-2 EV range with one-third increments. For sensitivity and continuous shooting details, see the Sensor page in our Features section. The SP-550UZ’s internal flash must be popped-up manually even in Auto mode by pressing a button on the left side. This may seem inconvenient for novice users, but we actually prefer a camera which doesn’t flash unexpectedly. Once popped-up, you can access the various flash options which include red-eye, fill-in and slow-syncro options. 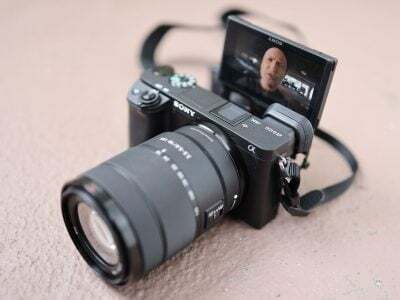 Three further menu options allow you to switch between front or rear curtain sync, flash compensation of +/-2EV and a slave option which provides ten different power settings for syncing with an external flash unit; there’s no hotshoe on the SP-550UZ though. The Olympus SP-550UZ uses xD memory cards (16MB to 2GB) and has a slot for them on the right hand side of the body. Olympus doesn’t supply a card with the camera, but the SP-550UZ does have 20MB of internal memory which is good for about four best-quality JPEG images; you’ll be wanting to get a card pretty soon then. Behind a flap on the left side are a combined USB and AV port, alongside a DC input for an optional AC power adapter. In a digital camera world increasingly powered by Lithium Ion packs, it’s interesting to find the SP-550UZ employing four AA batteries. Opinions are split between the benefits of these and Lithium Ion packs with some preferring the longer life and lighter weight of a Lithium pack (not to mention a charger supplied as standard), while others place greater value on the wide availability of AA batteries. One thing’s for certain though: Olympus only supplies a set of Alkalines to get you started, so you’ll need to invest in a set of rechargeables and a charger if you don’t already own them. We managed to get around 130 still photos and a few minutes of video footage – all with stabilisation active – from the set of supplied Alkalines. The low battery icon started flashing only moments before they expired too, so make sure you have some spares handy.